- Delivery: The Master Lock 176LH-P380 Combination Padlock is in stock and available to ship. The Master Lock No. 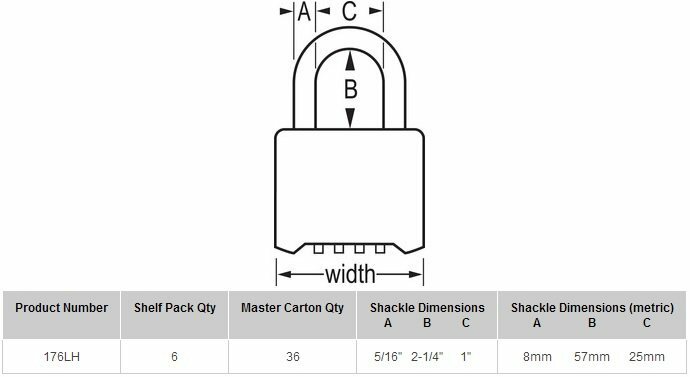 176LH Resettable Combination Padlock features a 2" (51mm) wide solid brass case for strength and weatherability and a 2-1/4" (57mm) tall, 5/16" (8mm) diameter hardened steel shackle for excellent cut resistance. The 4-digit dials allow you to set-your-own combination and reset to restrict/change allowed access - 10,000 combinations available. The key override features allows supervisory access at any time if needed. - Set-your-own 4-digit combination with key override feature for supervisory access. - 2-1/4" (57mm) tall, hardened steel shackle for cut resistance. - Order override key separately, K7. Key Control: The 176 Padlock has an additional feature of Key Control for supervisory access (Control Keys are sold separate, see "Companion Items" above).